Sitting in the Chicago hospital room where my father-in-law, Milton Shapiro, has often resided since November crystallizes the meaning of Hanukkah. So many rabbis have talked to me about light. And I see it there. Milt’s wife, my mother-in-law Phyllis, and their twin daughters, Sharon and Fern, both of whom also live in Chicago, never leave. They just sit, read or play word games on their iPhones. They worry and chat, knit and parse blood-pressure readings and dialysis cycles. They don’t tire or grow restless; they just stay. When Dave and I fly in from New York with our children, Ben and Molly, during Hanukkah, we all camp out at the hospital, too. As I watch Milt battle a failing kidney in his green patient gown, all the holiday metaphors rush to mind: the miracle of the oil lasting one more day; the miracle of doctors who keep trying; the miracle of a family that never leaves your side. Each person who shows up at the hospital—niece, brother-in-law, friend—seems like another candle, and the room grows palpably brighter with each arrival. I call Rabbi Mychal Springer to ask her about Hanukkah light—specifically the dispute between ancient rabbis Hillel and Shammai over how to properly light a menorah. 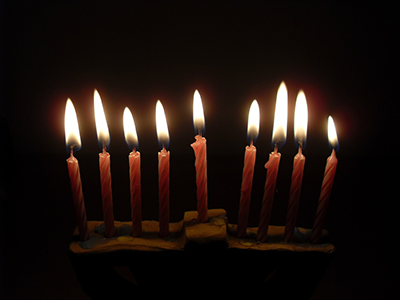 Hillel’s approach, which virtually every Jew follows today, adds one candle each night to build up to eight. Shammai’s way, by contrast, lights all eight candles the first night and decreases one each day to end up with one. While I’ve only known the Hillel way—adding candles—Springer prefers Shammai’s. “Shammai reminds me that we treasure that light for as long as it remains, without needing to pretend that it’s going to last forever,” Springer says. I summon her words during Milt’s waning days. The menorah itself offers another Milt metaphor. Jews usually light Hanukkah candles in a cluster of family or friends. A menorah gathers us. So does a sick parent. “Every night of Hanukkah, according to Shammai, we’re witnessing that there’s less light,” says Springer, “but the people are still together, night after night, and the diminishment of light is possible, or tolerable, because of the people being together. There’s a commitment to not walking away that brings light. As the light is dimmed, the people keep coming back.” And so we do. We keep returning to Milt, even when he’s moved from hospital to nursing home to hospice. Rabbi Abraham Joshua Heschel, a seminal thinker and social justice activist of the 20th century, wrote in his essay, “No Religion is an Island”: “We are called to bring together the sparks to preserve single moments of radiance and keep them alive in our lives, to defy absurdity and despair, and to wait for God to say again: Let there be light. And there will be light.” Maybe it’s because I’m watching my children grow up, or seeing my father-in-law falter, but I want so much “to preserve single moments of radiance.” So I’m sappy about these holiday symbols—the enduring menorah, the lifted darkness, the waxing and waning flames. Hanukkah meets me right where I am. This piece was adapted from Abigail Pogrebin’s new book, My Jewish Year: 18 Holidays, One Wondering Jew , which began as a series in the Forward. I was so moved by this piece. I have sat by many dear ones and friends as they were beginning their journey and leaving their physical world. I feel blessed as I was in awe as I held their hands. Thank you for this Chanukah time to reflect on our lives and the lives of our loved ones. What a beautiful and reflective article. It’s cold out this am and as I sat down to read your loving article I turned on my fireplace. As I read I looked into the flames that warmed me and am reminded by that light and it’s warmth of all the blessings in my life despite the challenges. Thanks for the reminder to go towards the light and the beauty currently in our family’s lives.